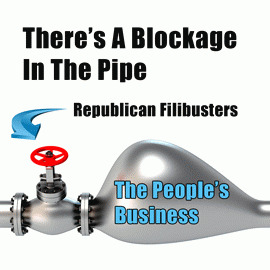 This is the fifth and final part of our miniseries on the filibuster, this one entitled "Unblocking The Pipe". This coming week the Senate, presuming we speak out in sufficient numbers, will once again confront a historic problem, the scourge of the filibuster, and in particular its radical and unprecedented abuse by the Republican party in recent years. Please submit the action page now if you have not done so already. And you should know that the Common Cause lawsuit, which we were following, that sought federal court intervention, has failed. We have studied the memorandum opinion, and the district court was swayed by the argument that political questions over procedure are not within judicial jurisdiction. Had there been a specific affirmative requirement in the Constitution that the Senate conduct its regular votes in a particular way the court might have ruled otherwise. But instead the Constitution expressly provides that the Senate can make up its own rules, albeit even bad ones, and so only a political solution is viable. And that is what we must make happen now. The most important thing to recognize is that the only thing that has ever forced any movement on filibuster reform has been the threat to change it unilaterally. There have been many attempts to reform the filibuster, but only when the Senate was completely fed up and ready to invoke the so-called "constitutional option" has anything ever actually happened. That was the case in 1917, when the original cloture rule was agreed to. At least 40 senators then supported a simple majority vote cloture rule. But a committee was formed to negotiate a compromise, and we got a 2/3 rule instead. That was the case in 1975, when on the first day of the new Senate session new rules were proposed, by simple majority vote, to reduce the filibuster threshold to 3/5 from 2/3 of those voting. Even though the votes were there to make that change, opponents engaged in additional dilatory tactics. This mini-filibuster forced a compromise to change the number to an absolute of 60 to break a filibuster, regardless of the number voting. If anything, this made matters worse, and has actually lead to the spiteful, routine filibusters that are now plaguing every bill or nomination that the Senate tries to consider. All the Republicans have to do is not show up and the Senate cannot conduct any business at all. They have shut down the pipe of the people's business and the blockage is complete. So today we are once again at a historic juncture. We are demanding that the filibuster be abolished entirely. It is only by pressing that demand that we will get any change at all for the better. Just as in 1975, the Republicans are threatening to use every other possible procedural trick to defeat the will of the majority. It must not happen again. We must unblock the pipe.